Bunk beds are a great space saver make bedtime fun for your little ones. Whether you’re looking for girls or boys bunk beds, one thing’s for sure. Finding the right wooden bunk bed is a great investment that might even grow with your child over time. We researched some of the top-rated, best-selling designs to help you find the right one for your family. Before we get into our products, let’s take a closer look at some of the important features to consider. Access: There are generally 2 ways to access the top bunk: a ladder or stairs. Ladders take up a lot less space and are much easier to assemble. Stairs, on the other hand, are safer to climb and often include additional storage. Weight Limit: This is the total limit for the whole bunk but you should consider the limit for each sleeping surface, too. They vary a lot, from 330 pounds for 2 bunks to upwards of 1000 pounds for a bunk with a trundle. Size: These bunks are all either twin-over-twin or twin-over-full. (Believe it or not, in one case it’s twin-over-twin-over-twin.) Having a full bed as the bottom bunk actually adds a lot of versatility and makes a great addition to a guest room. Finish: Most of these bunks come in a few different finishes, which is good news because you’ll most likely be able to find one that perfectly matches your decor. White, honey, natural, espresso… there are a lot of options! Dimensions: It goes without saying that you should make sure a bunk will fit into your kid’s bedroom. That said, we found a lot of different sizes so, no matter how much space you have, there’s a bunk to fit it. Warranty: Most of the products we chose come with a 1-year warranty. We did find one that’s for 60 days and a few with no warranty at all. Make sure you double check the fine print so you know what’s covered. Now that you know a little more about what to look for, let’s get into our wooden bunk bed review. Here’s the deal. Our top and budget picks are first on the list so that you’ll get to them even if you’re running short on time. That’s the best way to get an idea of the range that’s available. All of these products are unique, though, so stick around through the end if you can. Now, let’s get to it. Our pick for best bunk bed is this one from Max & Lily. For one thing, this is a really strong bunk bed. It uses solid pine slats and metal bars for mattress support. Believe it or not, each bed can hold up to 400 pounds to safely hold your kids even as they grow into teenagers. Alternatively, it easily separates into 2 beds if needed. The bed itself is made of solid New Zealand pine and covered with a durable, non-toxic finish. It comes in a few different color options: espresso, gray, natural, and white. The ladder to access the top bunk has easy-to-use hand holes and can be placed on either the left or right side of the bed. One more thing, for additional safety, the top bunk has 14-inch high guard rails. 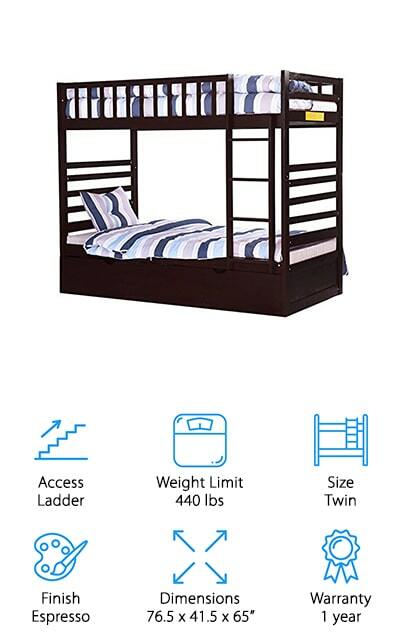 If you’re looking for cheap bunk beds, you can’t do much better than our budget pick, the Caribou Bunk Bed from Storkcraft. This bed is partially made of rubberwood, a naturally very dense and sturdy material that’s a great choice when it comes to bunks. It fits standard twin mattress and includes the slats needed for support. 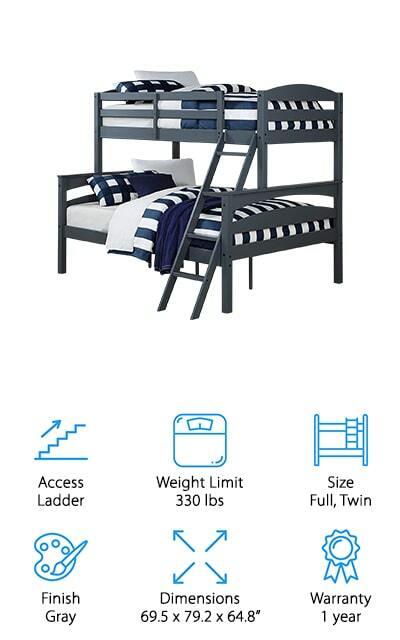 A sturdy 4-step ladder provides easy access to the top bunk which also features a full-length guard rail for added safety. Something really cool about this one is there’s an app where you can access step-by-step 3D assembly instructions so putting this one together is a breeze. It’s available in espresso, white, gray, and navy finishes and can convert it to 2 twin beds if needed. 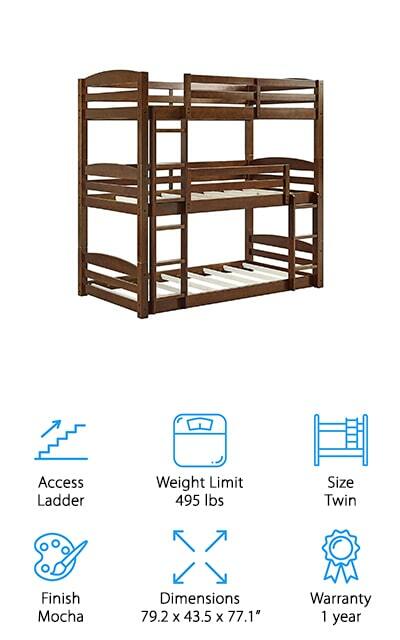 For a sturdy bunk bed with a little more room, check out the Dorel Living Brady Bunk Bed. It’s actually a twin-over-full design that can easily convert into 2 separate beds if needed. Mattress slats are included as this bed was designed to be used without a box spring. The ladder is angled making it easy to climb and, for extra safety, the top bunk features a full-length guardrail. 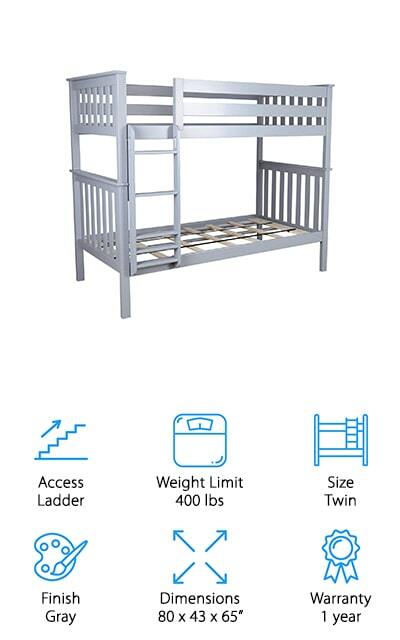 Each bunk can hold up to 165 pounds per level making this a great choice for a little kid’s room. Siblings will love sharing this space and there’s enough room for a friend to sleepover, too. Multiple color options are available so there’s a match for almost any decor. Choose from black, espresso, graphite, gray, and white. Next up is this gorgeous wood bunk bed from Palace Imports. This design features a twin-over-full setup and it’s done in a mission style. The bed itself is made of solid wood with a heavy duty midbeam and center leg support for extra strength. Because this design doesn’t use a box spring, they include 26 solid wood slats, 13 to support each mattress. One of the best things about this one is that it gives you a lot of headspace between the top and bottom bunk - just shy of 34 inches roughly. That means that the person on the bottom bunk has a lot of headspace and can even sit up comfortably. This bed is available in 3 different finishes, honey, java, and mahogany. 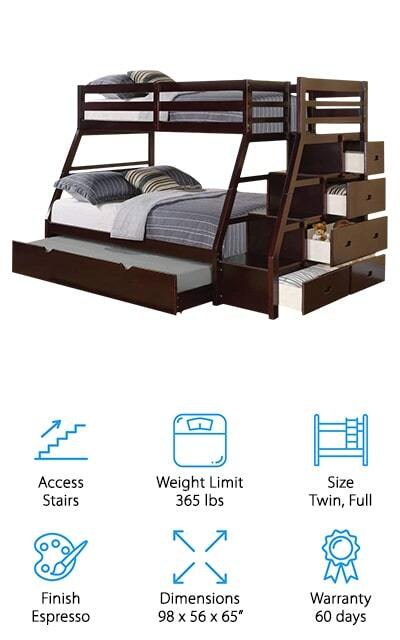 This design from Discovery World Furniture is a quality bunk bed with a twin bed on top and a full bed on the bottom. That’s not all, it also features a trundle bed for sleepover guests. The whole thing is made of solid wood and built to be strong and durable. In fact, each of the 3 beds can hold up to 350 pounds so it can definitely grow with your children well into the teenage years. A 4-step ladder can be mounted on either end to access the top bunk, which also has a central guide rail for additional safety. Each bed was designed to bed used without a box spring and all the necessary slat kits are included. Choose from 3 finishes: espresso, honey, or merlot. Our next pick for best wood bunk bed is this simple design from Merax. This is a great option if you don’t have a lot of room. At only 41.5 inches wide, it doesn’t take up a lot of space and will leave plenty of room for your kids to play. This twin-over-twin design also features a trundle bed, perfect for sleepover guests or as a place to store extra blankets, pillows, or stuffed animals. It even has casters on the bottom so it’s easy to roll it in and out from under the bottom bunk. That’s not all. The top bunk features safety rails all the way around and is accessed using a simple 4-rung ladder that attaches to the frame. One more thing, it easily separates into 2 twin beds. The Mainstays Wood Bunk Bed is next on our best bunk bed list. 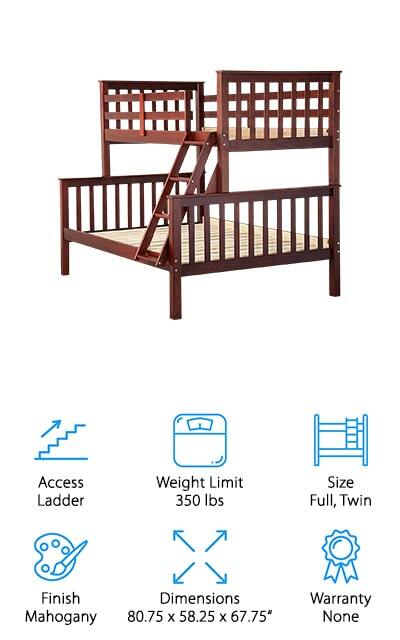 This twin-over-twin bunk features solid wood construction and a clean, simple design. 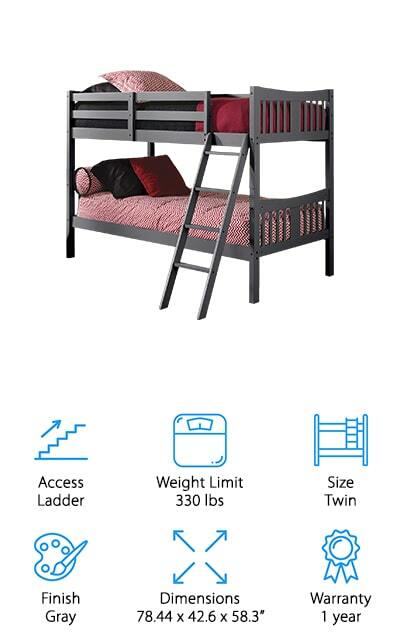 The top bunk, which is recommended for ages 6 and up, is accessed with a simple 4-rung ladder that’s attached to the bed frame. There are also guard rails around the top bunk for added safety. The black finish and simple lines go well with any decor while the curved head and footboards add just a little bit of extra style. These beds are made for coil spring mattresses without a box spring and all of the supporting slats are included. Plus, if your kids decide they don’t want bunk-style beds anymore, this piece can be broken down into 2 twin beds pretty. If you’re looking for a wooden bunk that can comfortably sleep 3 kids but aren’t wild about the idea of a trundle, listen up. 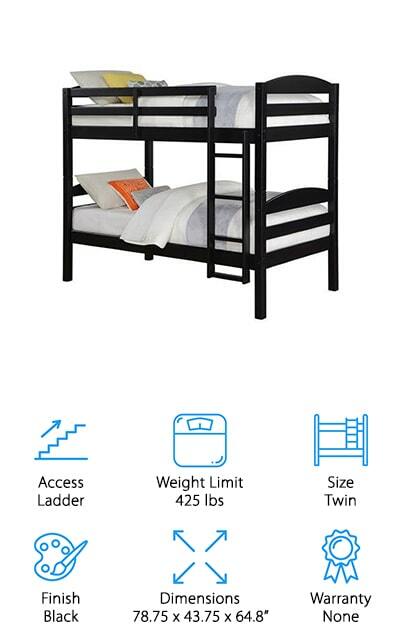 The Dorel Living Triple Bunk Bed is our next pick and it might be exactly what you’ve been waiting for if you have limited space. Believe it or not, this is a bunk with 3 proper twin-sized bed. No trundle needed! It features solid wood construction with a warm, mocha finish. Each bed fits a standard twin mattress without a bed spring. All of the support slats are included. The middle and top bunk each have their own ladder for access and guard rails surrounding them for added safety. That’s not all, you can even easily separate this bunk into 3 separate twin beds. 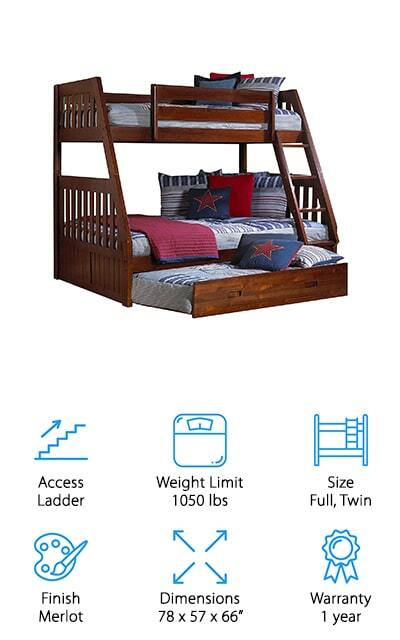 The ACME Jason Bunk Bed is a great option for anyone who’s looking for a bunk with a little extra storage. This is a twin-over-full design that also has trundle, perfect for frequent sleepover guests. When not in use, the trundle is also a convenient place to store extra pillows, sheets, and blankets. This bed is made of pine and MDF. It’s designed to be used with coil spring mattresses and does not require a box spring. All of the support slats are included. 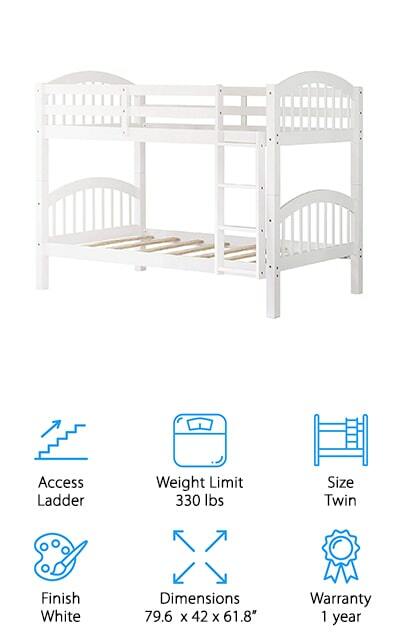 This is a great choice for young children because rather than a ladder, it has a small staircase to access the top bunk. That’s not all. Under the stairs are 5 drawers for extra storage. In fact, you could even use them as a second dresser for the room. Last but not least in our bunk bed review is this twin-over-twin option from Harper & Bright Designs. This simple design is perfect for any decor and the white finish matches any color scheme. The curved arches of the head and footboards add just the right amount of interest to the clean straight lines of the slats and frame. To make sure whoever sleeps on the top bunk is extra safe, there’s a sturdy 4-rung ladder for access as well as full-length guardrails on both sides. This bunk also breaks down into 2 twin beds if you no longer need or want bunks. This bed is made of solid wood and durable enough to hold 165 pounds on each level or 330 pounds total.